Last weekend we received 6 beautiful brand new boats. They were made specifically for us and I got to paddle one of them for the first time. Wow, I don't think that I ever paddled a brand-new, never paddled before boat. It was a surreal feeling. So what was it . . . well h old on to your paddles and put away your skirts, it was a new Dagger Torrent. A what? Yes, I was paddling a sit on top whitewater kayak. 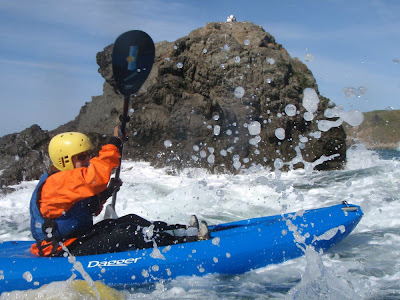 We bought 5 of them for 2009 because we have been having so much fun with rock gardening in our whitewater kayaks that we wanted to share the fun with those who don't want to paddle a decked boat. 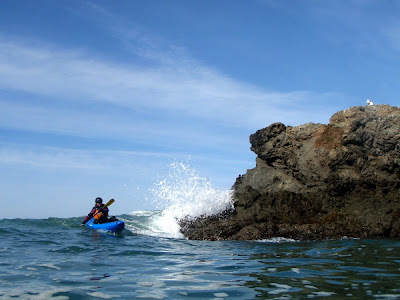 Typically I paddle a Necky Jive when we are rock gardening in whitewater kayaks - aka "short boats." The Jive is fast and carves nicely. My first impression of the Torrent was how nice it was to just jump on and paddle and not have to deal with the skirt. I liked that I could kick my legs out of the thigh straps when paddling straight stretches. I was very impressed with the tracking of the boat. We were paddling in 10 foot swells that would have had me bobbing and spinning about in the Jive, but the Torrent tracked straight as I paddled it with little correction. The Torrent was super maneuverable though and I could face the swell and spin a 180 to get onto the wave with ease. I am not one to push the limits in a new boat and the conditions were not ideal so I will have to paddle it again to see how well it handles in our favorite pourovers and surge channels. I did a couple of eskimo rolls with it just to see what would happen and found it fun to roll. I think that our new Torrents are going to be the user friendly boat that we were looking for to share our rock gardening playground with others. Stay tuned for more reports and photos. And of course I mentioned 6 new boats (only 5 were Torrents). A new sea kayak is still awaiting its maiden voyage.